My daughter celebrated her 30++ birthday the beginning of last week, and her card is actually what got me back into making cards again after such a dry spell. I have been waiting for her to receive it in the mail, but it seems lost :( So at least I have this way to share it with her while I still hope that it turns up in her mailbox soon!. A few months ago, I talked about how sitting down and just jumping in and coloring a stamp is what seemed to break through the lack of creativity I had felt for so long. Well I knew about halfway through coloring it, that it was going to be part of my daughter's birthday card because it was all about being carefree and flight and beauty. So I set it aside until it was time to make her card. 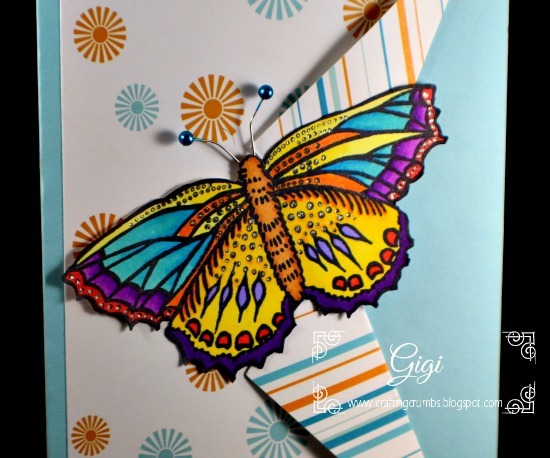 It would have been SO much easier if I had chose the patterned papers first before I colored the butterfly - but why should I do anything the easy way! So I was overjoyed when I actually found colors that would work! 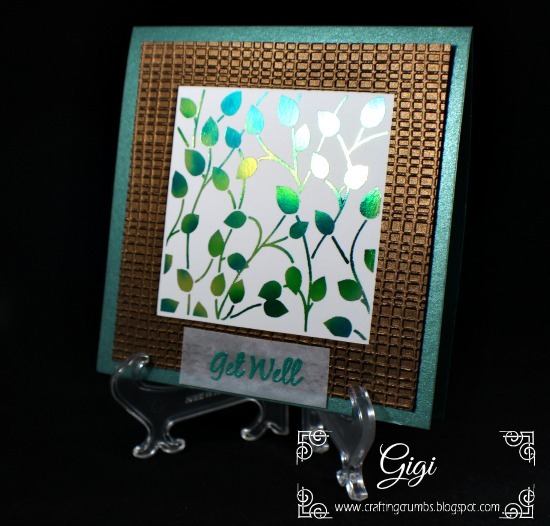 The stamp is from the Sheena Collection from Crafters Companion. Her stamps are some of the few I still have that are made from rubber. with the Silver Bullet. 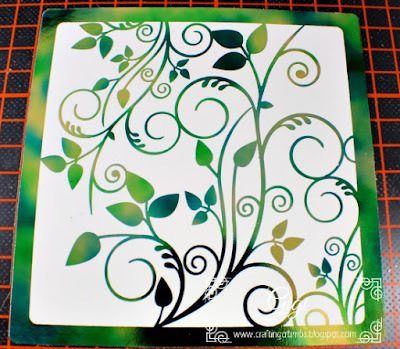 So much easier than fussy cutting - and so much quicker! to the flowers in the first photo above. It's simple but so pretty. 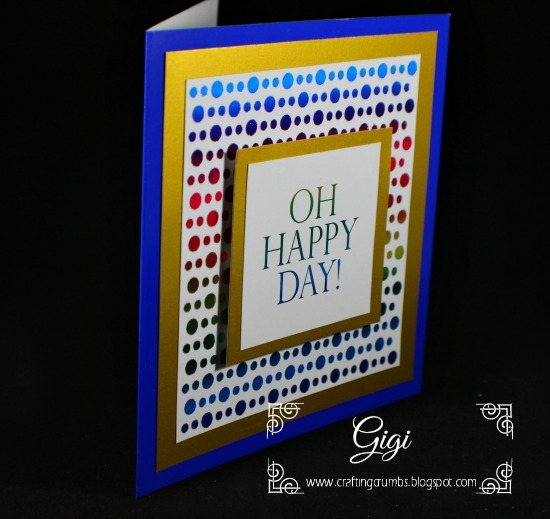 I love how this card turned out. 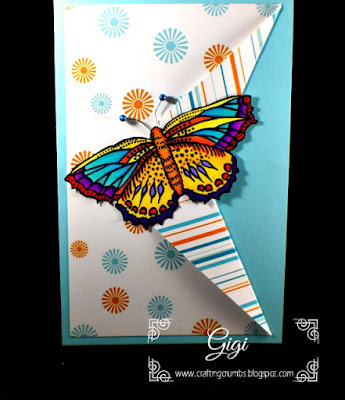 It was inspired by a card I found on Pinterest that used double sided patterned paper and folded it back in an interesting way - a way I had never considered. I hope to play around more with different ways to present a card and see if that unleashes a little more creativity. And it was such fun to color. Looking forward to more of that as well. 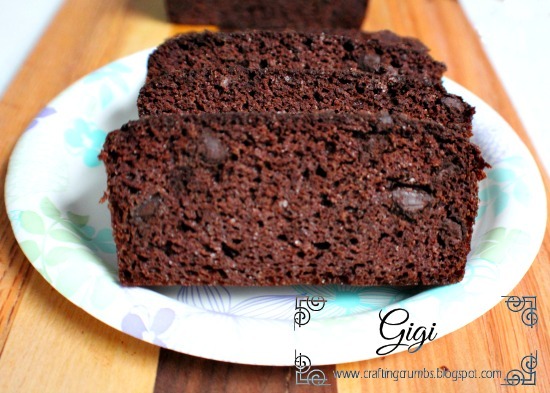 This recipe was a delicious adventure into grain free baking and it turned out great. I am still not used to the way breads "don't rise" - but I am working on getting the best results I can - and accepting this "new normal". 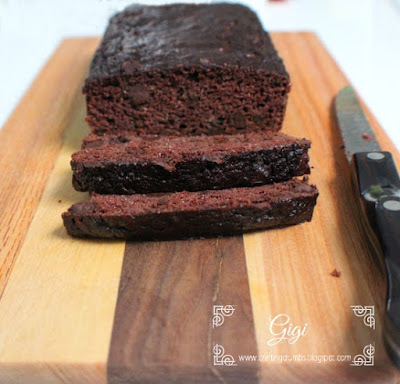 The rich taste makes up for the fact that it looks different than my baking used to - but that's ok. Grease a medium loaf pan and line the bottom with parchment paper. Dust the sides of the pan with coconut flour. Place the shredded zucchini in between several layers of paper towels or roll it up in a dish towel and wring out the excess moisture. In a food processor or mixer, combine the zucchini, eggs, oil, maple syrup, and vanilla. Add the flour, cacao powder, baking soda and salt and stir until well blended. Let the batter rest for a few minutes. Ready for the oven with extra chocolate chips on top! 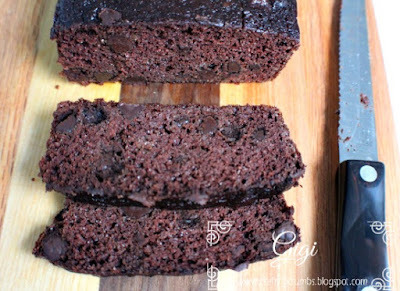 Then mix in chocolate chips and pour the batter into the prepared loaf pan** (I like to sprinkle 1-2 T. chocolate chips on top for a little extra goodness and bake for 45-50 minutes or until a toothpick inserted in the center comes out clean. Cool on a wire rack. Store covered at room temperature for several days or in the refrigerator for a few weeks. It also freezes well. First of all, I want to wish the happiest Mother's Day to my daughter, daughter in law and so many dear friends. Even though we all know that EVERY day should be Mother's Day :), I hope today was extra special for all of the amazing mothers I have been blessed to know along the way, especially my own mother and grandmothers. 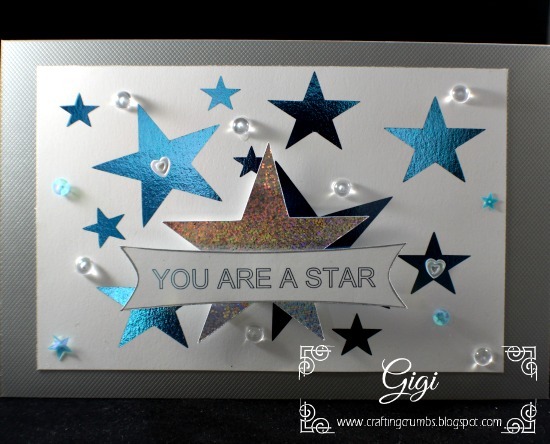 Continuing my preoccupation with foiling (sorry -I just cannot get enough of it! 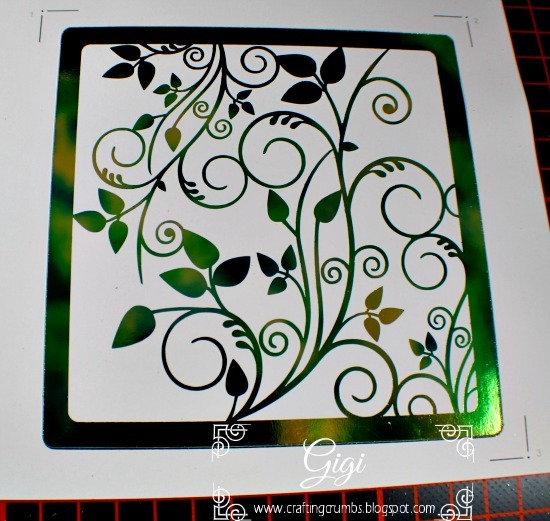 ), the card above was a traced stencil, scanned and printed and foiled with watercolor Decofoil. I love all of the beautiful shades in the watercolor foil. 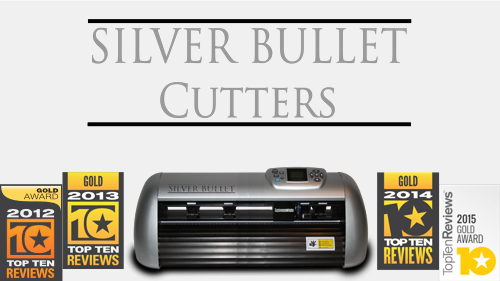 The foiled image was cut on the Silver Bullet Professional using the print and cut method in SCAL, as was the foiled greeting tag that was threaded on the ribbon. The tag was printed on a 3M transparency and ran through the FoilMaster with ease. 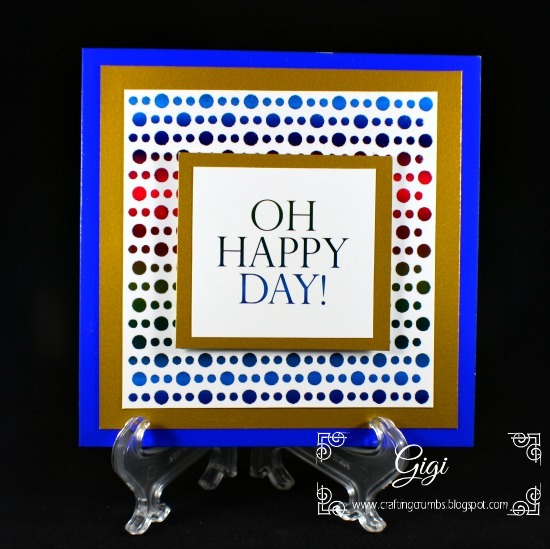 Assorted sequins and beads were added (see pics below) to give it some added interest. A perfect cut thanks to the Silver Bullet and SCAL software. when doing the laser registration. 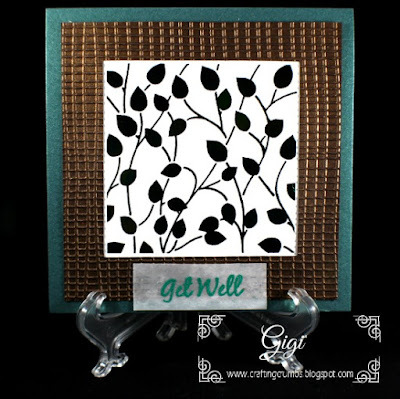 It seems like I have been making a lot of get well and sympathy cards of late. 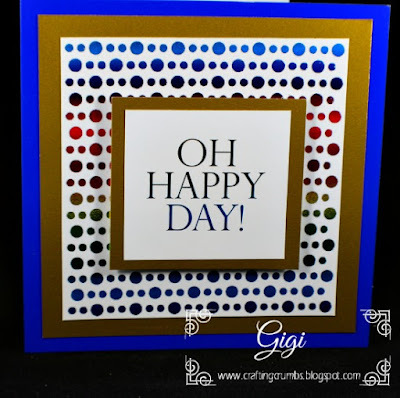 So it was a nice respite to be able to make two celebratory cards today - one planned and one unexpected - more on that later! First up is a card for my oldest son. It is so hard to believe that Scott is now 42. Yikes! We celebrated with a brunch down here a few weeks ago, which was a win-win for me. I not only got to have a little extra time with my son, but he is part of a package deal (! ), so I could also enjoy time with my daughter in law and precious grandson as well. I felt like I was the one getting presents - so thrilled to have the gift of time with those I love. I really cherish(ed) every minute. 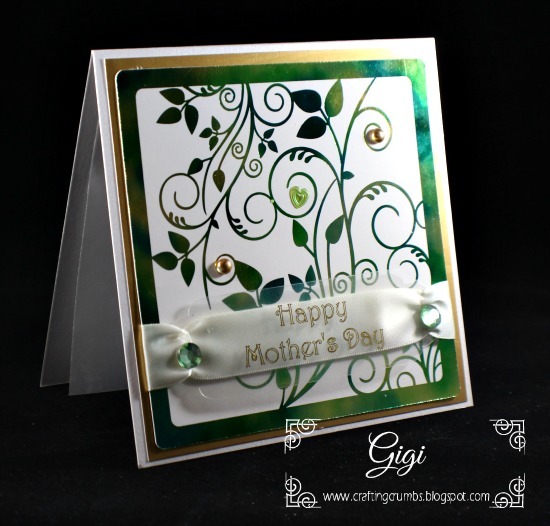 I have been doing a lot of foiling and Scott's card was no different. rainbow foil. 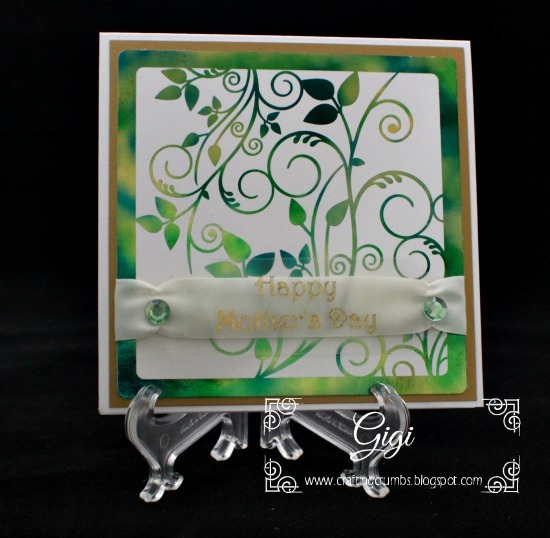 The greeting is from Gina K Designs. You can see the dimension of the card here. 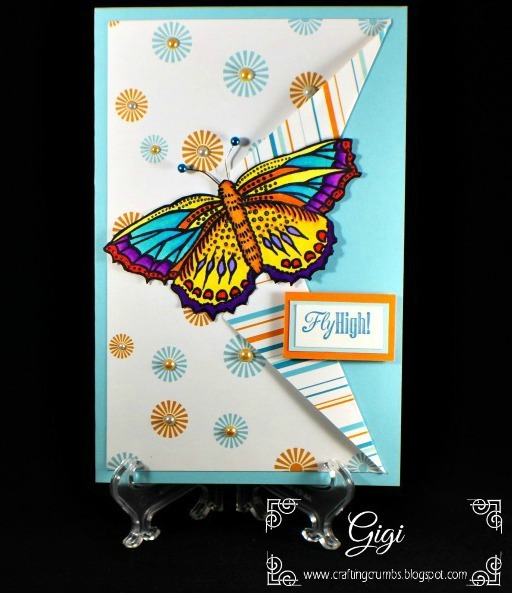 I also had the opportunity to make a card for an amazing young woman. I spend some of my free time volunteering for the Oceanside Boys & Girls Club and serve on the board. I love the programs we offer our youth and find such joy in watching them blossom as they grow and find their way. One young lady stole my heart a few years ago when I met her during judging for Youth of the Year. she didn't win that year, but she had an amazing story and I could see the potential in her - we all could. She went on to win the next two years. This year when she completed at the county level, she won and became San Diego County Youth of the Year. The next step was the CA state competition a few weeks ago and guess what??? Yep - she won - again! We are all so proud of her. She graduated from high school last year with a GPA well over 4.0 at the age of 16. She is now enrolled at the local community college where she is excelling. She is bright, charming,thoughtful, humble, and inspiring to one and all. What an amazing role model for our youth. She attended our board meeting the day after returning from the state win, so I made her a congratulatory card from the Board. It was so much fun to do because I think the world of her and am so proud of her and excited for her. I just know she is going to have an incredible life, no matter what happens with the remaining competitions. There is a regional competition in June, and then that winner goes on to compete for the national title! What an experience no matter what........I know her star will continue to shine bright for many years to come. 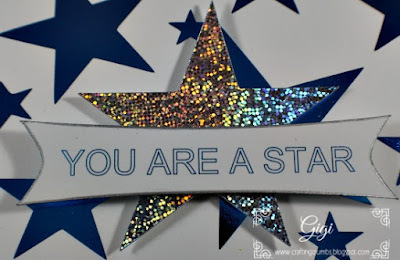 So with stars in mind, I used a stencil that I printed and foiled, and then created a fun little banner with the greeting. That was printed with a gel pen in the Silver Bullet. I don't draw with pens in the machine often, but every time I do, I make a promise to myself to do more of it because it is really so much fun and the results are beautiful. in the Silver Bullet Professional. Then the banner was cut out. get an idea. It is so pretty in person. This was one of the first main dishes I made using "faux rice" - otherwise known as grated or chopped cauliflower. And let me tell you - I had my doubts about what it would really taste like. The good thing is that I don't mind cauliflower - I actually like it most of the time so I was trying to keep an open mind. BUT..... I was totally surprised. What happens, at least in this case, is that the cauliflower takes on the flavors that surround it - so you end up tricking your palate. Sure the texture is different, but when the taste is there, you really don't mind! I served it to my youngest son for our standard "family" Sunday dinner and he loved it! **I like to take the cauliflower florets and grate them in the food processor. It's easy and not quite as messy doing it that way. And it's quick too. One head of cauliflower will yield about three cups of "cauli-rice". Preheat the oven to 375. You want to bake this in the middle of the oven so change the rack if needed. In a large skillet, melt the coconut oil over medium heat. Add the white parts of the green onions, half of the green parts (the remaining are garnish) and the ground beef. Cook until there is no pink remaining in the meat. Push the meat and onions over to the side of the pan, and place the cumin and garlic in the center of the pan. Stir until the spice aroma is released and smells wonderful (about a minute) and then mix the meat into it. Add the grated or riced cauliflower, the canned chilies (drained), part of the cheese (about one cup) and the salt to the pan and stir just until they are all mixed well. The peppers all lined up - just waiting to be filled. Put the peppers cut side up in a 13x9 inch pan. Divide the filling mixture evenly between the peppers. 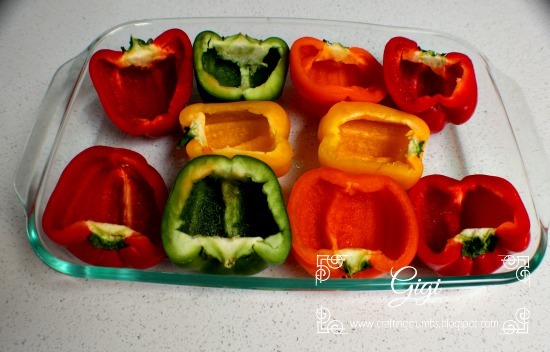 Pour 1/2 cup hot water in the bottom of the baking dish, being careful not to get any into the peppers! Cover the peppers with a sheet of parchment and then cover the parchment with a piece of foil and seal tightly over the top of the dish. 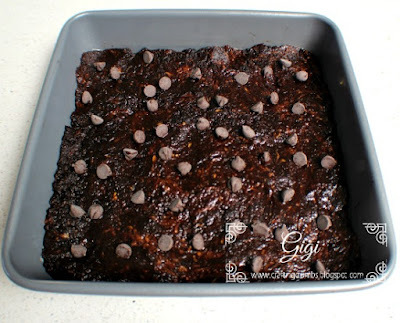 Place in the oven and bake for 25 minutes. 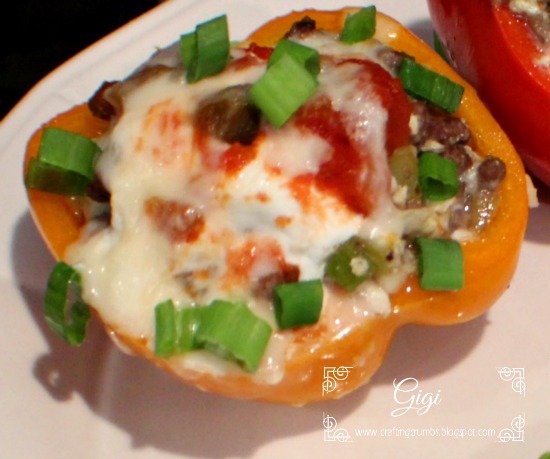 Remove the foil and parchment and top each pepper with a spoonful of sour cream and salsa and then sprinkle the rest of the cheese over the top of each. Return to the oven for 10 minutes or until the cheese is golden and bubbly. Sprinkle the remaining green parts of the onions over the peppers and serve and enjoy. 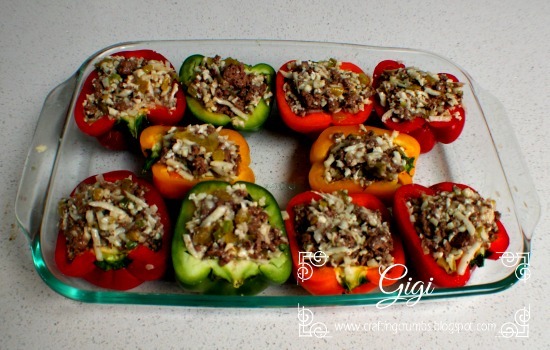 These are so yummy and reheat well too! This is how they look ready to go into the oven - so colorful and good too! Melted cheese makes everything better! It seems the older I get, the more I am making get well and sympathy cards. And maybe that's not true - perhaps the numbers have not changed all that much, but they are certainly impacting me more! Some dear friends in northern CA lost a family member recently. It was not totally unexpected, but no matter how old you are or how prepared you "think" you are, it is always difficult to lose a parent. They have been so grounding most of our lives and it throws off the balance of our world for a time being and pushes us up into that role of Matriarch or Patriarch, depending. I don't think we are ever ready for that. I know I wasn't. This was a simple card - basically it's a reverse stencil that I cut out of the background rather than using the individual pieces. 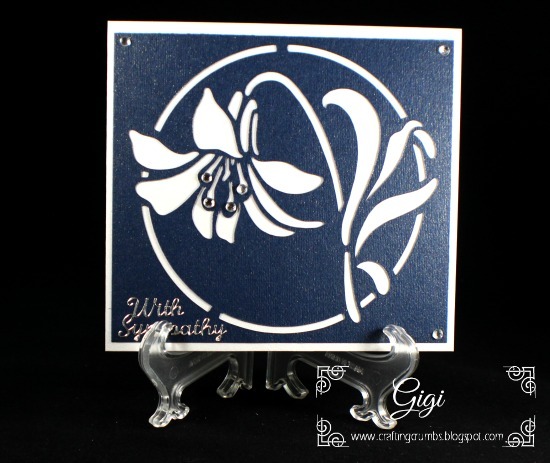 It gives the look of an inlaid design and I like that. I just wanted them to know that they were in my thoughts and prayers. My neighbors are having an extended stay next door. They have been living in the condo while he recovers from foot surgery. They have a huge beautiful home not far from here, but it is three stories so staying in the condo with one level and elevator access to it from the garage, makes this the perfect place for healing! He has had complications, so their stay here has been extended. I am not complaining because I enjoy having someone next door. I used the FoilMaster to craft his get well card and, as usual, I am now looking at new fun ways to use foil. 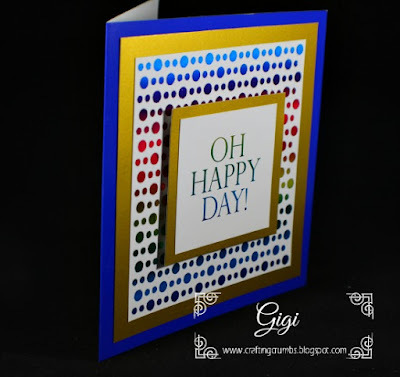 Be prepared to see more of it because I am loving the look of it and between the laser printer and the FoilMaster, they are providing great results. Photographing it is challenging...the colors are so beautiful. especially when I print at 1200 dpi. and then the colors come to life! Another angle shows a wider variety of colors. 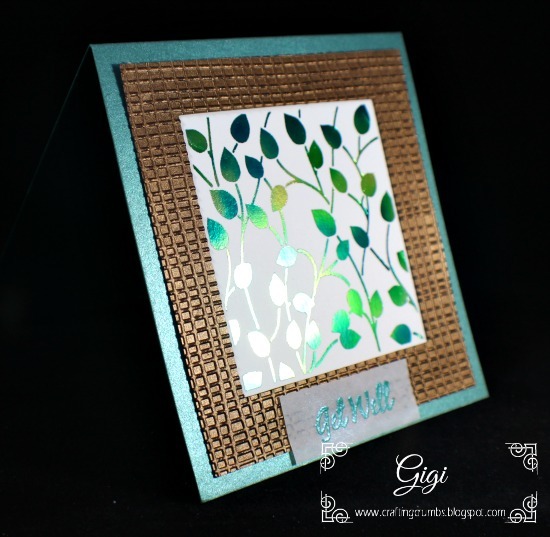 An embossed "frame" made it complete.